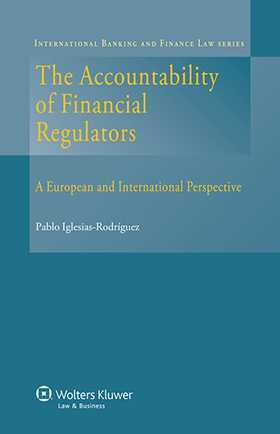 Chapter 1 The Accountability of Financial Regulation and Supervision Authorities: The Defining Elements. Part I The Accountability of Financial Regulation and Supervision Authorities in Spain, the United Kingdom and the United States of America. Chapter 2 The Structures of Financial Regulation and Supervision in Spain, the UK and the US. Chapter 3 The Accountability of FRSAs towards Political Forums in Spain, the UK and the US. Chapter 4 The Accountability of FRSAs towards Stakeholders in Spain, the UK and the US. Part II The Accountability of the European Supervision Authorities in the Financial Field and of the European Systemic Risk Board. Chapter 5 The Post-financial Crisis European Financial Supervision Architecture and the Need for Enhanced Accountability. Chapter 6 The Accountability of the European Supervision Authorities in the Financial Field towards Political Forums. Chapter 7 The Accountability of the European Supervision Authorities in the Financial Field towards Stakeholders. Part III The Accountability of International Networks of Financial Regulation and Supervision Authorities. Chapter 8 International Networks of Financial Regulation and Supervision Authorities as Global Standard-Setters. Chapter 9 The Accountability of International Networks of Financial Regulation and Supervision Authorities.